HIGH TECH PET makes the most reliable and dependable electronic dog fences on Earth. But, sometimes even our products wear out or get broken. If your system has stopped working, use the troubleshooting guide below to figure out with items to readjust or replace. Keep in mind that the most common parts needing replacement are (in order) the collar battery, the collar itself, the transmitter or the transmitter's AC adapter. Sometimes the wire gets broken due to ground freezing, gophers or moles chewing the wire or mowing. In that case you will need to repair or replace your wire. If you need help troubleshooting your system you can always reach us by phone, email or fax, we're here to help! 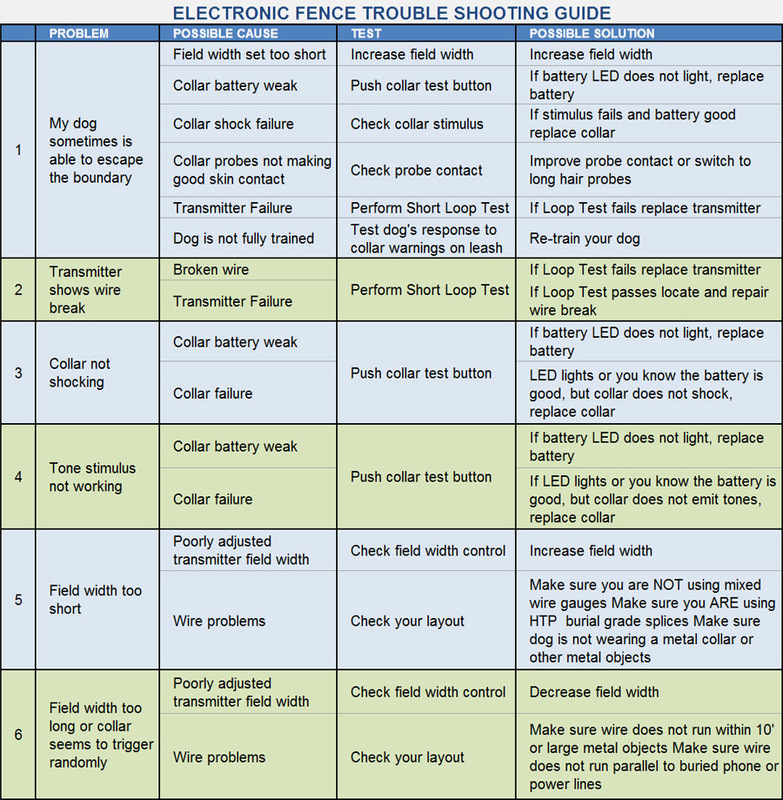 This test is designed to identify if the malfunction is occurring� in the collar, the transmitter or the wire loop. Disconnect the outdoor wire loop from your� transmitter. Cut a piece of wire about 10&quot; long and strip the ends� exposing about � inch of the copper wire. Plug the ends into the transmitter terminals in place of the outdoor loop wire. Turn on your transmitter. SYSTEM: If no indicators are illuminated, your transmitter needs to be replaced. "OK" indicates that all circuitry, hardware and software are functioning properly.� If the "FAIL" indicator is illuminated with the short loop installed, your transmitter needs to be replaced. 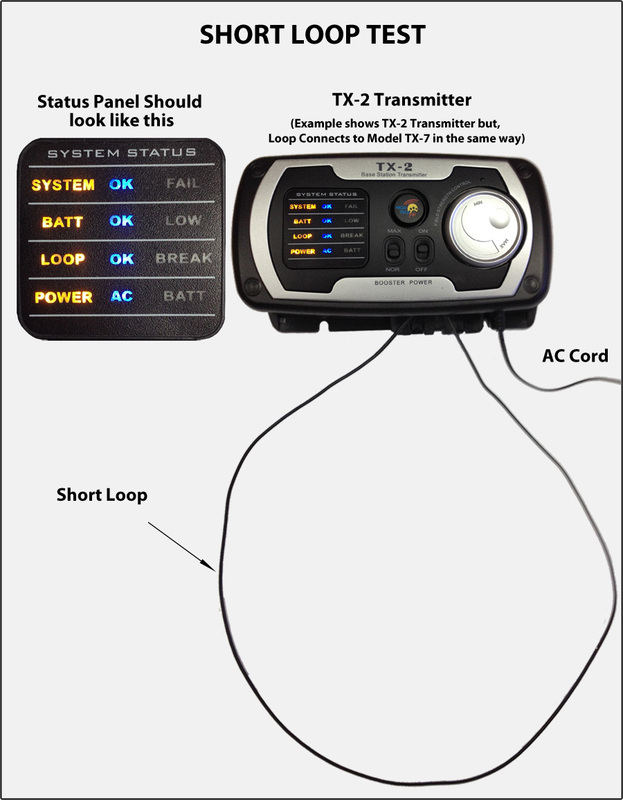 LOOP: If no indicators are illuminated, your transmitter needs to be replaced. "OK" Indicates that there is electrical continuity in the short loop. If the "BREAK" indicator is illuminated with the short loop installed, your transmitter needs to be replaced. Disconnect one of the ends of your short loop from its terminal. The audible warning should sound and the LOOP "BREAK" indicator should illuminate. If this is not the case, your transmitter needs to be replaced. illuminated. If it is not, your transmitter needs to be replaced. If you have a back-up battery, turn your transmitter off and install the battery. With the AC wall adapter plugged in, turn the transmitter back on. The POWER "AC" indicator should illuminate and the "BATT" indicator should show either "OK" or "LOW" depending on battery charge. If this is not the case, your transmitter needs to be replaced. Unplug the AC adapter from the transmitter. All appropriate indicators should now flash. The POWER "BATT" indicator should be flashing and the "AC" indicator should be dim. If this is not the case, your transmitter needs to be replaced. CABLE: If neither LED is illuminated, your transmitter needs to be replaced. The "OK" LED Indicates that there is electrical continuity the short loop. This LED should be illuminated. If the "BREAK" LED is illuminated your transmitter needs to be replaced. POWER: The "AC" LED should be illuminated. If it is not, your transmitter your transmitter needs to be replaced. Disconnect one of the ends of your short loop from its terminal. The audible warning should sound and the CABLE "BREAK" LED should illuminate. If this is not the case, your transmitter needs to be replaced. For the RC-7 and RC-8 collars, make sure there is a new battery installed before performing the following test. For the RX-10 make sure the collar has been charged for a full three hours. The RX-10 must be turned on. Press the "TEST" button on your collar. The LED should illuminate indicating good battery charge and a tone should sound indicating good shock output. If either of these indications fails, your collar needs to be replaced. Power your transmitter with the AC wall adapter and turn it on. Turn the FIELD WIDTH (STRENGTH) control fully clockwise. Make sure you are not touching the collar shock probes. Starting about 10' back from the short loop slowly bring the collar toward the loop. �A few feet from the loop the collar should begin to beep. As you move the collar closer to the loop the rate of the beeps should increase. If the collar does not beep very close to the loop, it needs to be replaced. Now turn the FIELD WIDTH (STRENGTH) control fully counter-clockwise. Making sure you are not touching the shock probes, bring the collar very close to the short loop. If the collar beeps, your transmitter is defective and needs to be replaced. Disconnect your short loop and reconnect your outside wire loop. Turn your transmitter on. If the LOOP or CABLE indicator shows "BREAK" there is a break in your outdoor wire. You will need to locate and repair the break. If the LOOP or CABLE indicator shows "OK" and you are still having a problem with your system, the problem is most likely in your wire set up. Either the wire is laid out incorrectly or there are environmental issues such as buried power lines, or large metal objects interfering with and corrupting the RF signal. To check your wire layout refer to your user manual.